In 1946, two years after Howe entered the NHL, the Red Wings won their first of seven straight regular-season championships. The Detroit Red Wings were a powerhouse during Gordie Howe's time. But one team during that era stood out above all others. But first, a little background on the legacy of excellence the Wings carved out with Howe. Two years after Howe broke into the National Hockey League in 1946, his Detroit Red Wings won the first of seven straight regular-season championships. They also won the Stanley Cup in four out of the next six seasons -- 1950, 1952, 1954 and 1955. In the 1950 season, Howe and his Production Line teammates, Ted Lindsay and Sid Abel, became the only line in NHL history to finish 1-2-3 in regular-season scoring. Beginning in 1950, Howe would go on to finish among the top-five NHL scorers for 20-consecutive seasons and he won the Art Ross Trophy as the NHL's top scorer six times, beginning in 1951. He also won the Hart Trophy as the Most Valuable Player six times. The 1950 Red Wings won the regular-season title by 11 points over the Montreal Canadiens and swept their nemesis, the Toronto Maple Leafs, in the first round of the playoffs. They then swept the Montreal Canadiens in the Stanley Cup Final. Wayne Gretzky and Gordioe Howe have formed a mutual admiration society, and if you get them together and ask them who was the greatest hockey player of all time, they'll answer, "He is." The Red Wings would win three more Cups, but Detroit General Manager Jack Adams said that 1952 team was the best. "Our 1951-52 champions that won the playoffs in eight straight games was the greatest hockey club ever assembled," Adams said. As the only man to have his name engraved on the Stanley Cup as a player, coach and general manager and having been in the NHL since 1917, Adams was in good position to judge. Adams was a proud and boastful man and nothing made him happier than to tell the story about how the New York Rangers passed on 15-year-old Gordie Howe when he went to their training camp, allowing Adams signed him the next year. It took three more years for Howe to develop into a star but Adams always said he saw it coming. "Picking him out of a bunch of kids at training camp and watching him develop has been my greatest thrill," Adams was quoted by Kevin Shea of the Hockey Hall of Fame. Howe was the centerpiece of a well-constructed club that included several other players who would join Howe in the Hockey Hall of Fame, including goalie Terry Sawchuk, defensemen Leonard "Red" Kelly and Marcel Pronovost and forwards Abel, Lindsay and Alex Delvecchio. In the 1951-52 season, Howe played right wing on the Production Line centered by Abel with Lindsay at left wing. Delvecchio came up early that season and centered the second line, which had Metro Prystai on the right wing and Vic Stasiuk on the left side, until midseason when Johnny Wilson was called up and took over the job. Glen Skov centered the checking line that had Marty Pavelich on the left side and Tony Leswick at right wing. Kelly was a highly skilled defenseman that could also play center against rivals' big centers. Pronovost played left defense with Leo Reise Jr. on the right side. Kelly also played the left side with Reise. Bob Goldham often played on the right side when Reise rested but he also played left defense. Benny Woit was a solid No. 5 defenseman. "They had a great team, everything a team needs, a great goalie, great defense and a great group of forwards," said Montreal Canadiens center Jean Beliveau. "They had two good offensive lines and a good defensive line. That's what you needed in those days. "I always enjoyed playing against them in the Olympia because it had the best ice, great fans and it was two offensive-minded teams going back-and-forth, one end to the other, all night long. I always thought the people who attended the games at the Olympia were seeing great hockey." But, the Red Wings best team took some time in the making and had to suffer some setbacks first. Detroit and Toronto had contested the 1948 and 1949 Stanley Cups with the Maple Leafs winning both, becoming the NHL's first repeat champions since the 1936-37 Red Wings. Both teams were set for a stirring battle in the 1950 semifinal, the setting for one of the scariest moments in NHL history. Early in Game 1, Howe attempted to check Maple Leafs' captain Ted "Teeder" Kennedy, who was carrying the puck along the right boards. 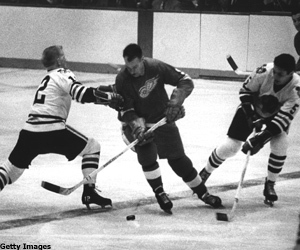 Howe was pursuing and overtaking Kennedy in an attempt to run him into the boards. But Kennedy stopped short and Howe plunged head-first into the boards. Howe was rushed into surgery and holes were drilled into his head to relieve pressure on the brain. 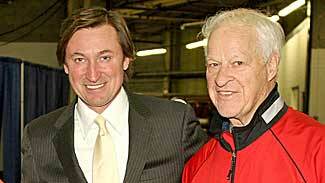 "Kennedy was a powerful skater but Gordie was catching him because Teeder was carrying the puck," Kelly recalled. "Teeder pulled up because Black Jack Stewart had him in a precarious position, nowhere to go. Stewart teed off on Kennedy and it was a three-way collision with Gordie getting the worst of it. It was only about four-and-a-half minutes into Game 1 of the semifinal. "They didn't think Gordie would ever play again after the surgery but he returned the next season and had a great career." The Red Wings struggled to beat the Maple Leafs in seven games and then went on to defeat the plucky New York Rangers in seven games to win the Stanley Cup. That was the year the Rangers couldn't play their Stanley Cup Playoff games at Madison Square Garden because the building had been booked for the circus. Howe, who had finished third in scoring behind Lindsay and Abel in 1950, returned to win his first Art Ross Trophy in 1951 when he had 43 goals and 43 assists for 86 points, 20 more than Montreal's Maurice "Rocket" Richard. The Red Wings caught fire in the second half of the season behind Howe's scoring and finished six points ahead of the Maple Leafs and 36 points ahead of the third-place Canadiens. Howe had four goals and three assists against the Canadiens in the semifinal but the Red Wings were upset in six games as the Habs rode the play of the Rocket and goalie Gerry McNeil. However, Toronto downed the Canadiens for their fifth Stanley Cup in seven years. After being upset in the 1950-51 season, the Detroit Red Wings returned for the 1951-52 season as one of the greatest teams to ever play the game. So, it was a determined Red Wings' team that returned to training camp for the 1951-52 season and they produced one of the greatest years of any team in NHL history. The Red Wings got off to a hot start and wound up winning the regular season by 22 points over the Canadiens. They scored 215 goals and surrendered only 133 and Howe led the League in scoring for the second-straight season with 47 goals and 39 assists for 86 points. Lindsay was second with 69 points. The Red Wings had made a couple of important moves. They had won the 1950 Stanley Cup with Harry Lumley in net, but Sawchuk had impressed in a seven-game stint. Lumley was traded and Sawchuk won the Calder Memorial Trophy in 1951. He was outstanding in 1952, posting a 44-14-12 record with a 1.90 goals-against average in the regular season. 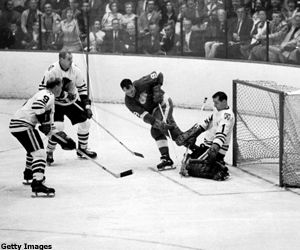 Sawchuk then had the greatest Stanley Cup Playoff run of any goalie in history. He was 8-0 with an 0.63 GAA and gave up only five goals, none at the Detroit Olympia. Leswick was an important member of that 1950 Rangers' team, but his scoring slipped the next year and Detroit acquired him to be a defensive pest on the third line. Delvecchio was promoted early in the season and he had 15 goals and 22 assists while centering the second line. The Red Wings also brought up Johnny Wilson with 28 games remaining and the future NHL coach had four goals and five assists. But Wilson exploded in the playoffs with four goals and an assist. Howe, Lindsay and Prystai tied for the playoff scoring lead with seven points. Lindsay had five goals to top all scorers. "We were hungry and we had a good coach in Tommy Ivan who was very good with us," Prystai recalled. "Ivan came to us before the last game against the Canadiens and talked to each of us separately, Delvecchio, Wilson and me. He said we could win this series tonight and he was right. I scored two goals and Wilson scored one, while Delvecchio had a couple of assists. "We were leading the fourth game against Montreal in the Forum and they had a power play. Doug Harvey took a shot from the point. I blocked it and took off like a scared rabbit. I deked McNeil right and shot to the left and scored the final goal that made it 3-0." Howe remembers that team, and particularly his line that year, like it was yesterday. "We had a miserable kid on the left wing who would fight the world," Howe said of Lindsay. "Ted was tough, hockey-wise. There was nothing too rough that would prevent him from trying to score a goal. Abel was older, our mentor. He told us what to do and we went out and did it. "Sawchuk was great, but in practice he was miserable, he hated it," Howe continued. "I would come off the right wing and he'd leave the whole right side open for me. 'Don't hit me,' he'd say. One day, I shot a puck that was rolling. You have no control over a rolling puck. I hit Terry on the shoulder and he chased me halfway down the ice." Howe has always avoided saying one Red Wings' team was better than another. Kelly, who got hurt in the 1952 semifinal and played only the first game against Montreal in the Stanley Cup Final, understands. "I always thought the 1950 team was better but we won that Stanley Cup without Gordie Howe and in 1952, they won without me! We won the regular season seven years in a row while changing personnel constantly. That's our claim: Seven straight League championships and four Stanley Cups in six years."